Panthers supremo Ged Rathbone is targeting a roaring start to the Premier League season despite a stack of availability issues. The city team travel to Redcar tonight (7.30pm) for their league opener before entertaining Rye House at the East of England Showground on Sunday (5pm). They also have their final Southern Group outing in the Premier League Cup at Somerset tomorrow night (Friday) although their chances of qualification to the latter stages could be over by the time they arrive at the Oaktree Arena. A poor start – Panthers lost their first three competitive meetings - looks like costing them dear in that competition and Rathbone is anxious to avoid a similar fate in the league. Rathbone said: “Being a Middlesbrough man, it is a very big meeting at Redcar for personal reasons. I go there to watch every week and it’s certainly a place where I want to win. “I also think it is somewhere we should be able to get a result if we are serious about challenging for the title. “We look like paying the price for a bad start in the League Cup and I do not want to be in a similar position in the league. “We need a good haul of points from the Redcar and Rye House meetings to show everyone we mean business. Teen talent Robert Lambert misses all three meetings due to commitments with his Elite League club, King’s Lynn. Club bosses have drafted in former Panthers man Claus Vissing to replace Lambert at Redcar and Somerset, while Somerset rider Brady Kurtz deputises in that position against Rye House. Panthers continue to use guests to fill the number one spot with Olly Allen ruled out for the season and a search for a potential replacement so far proving unsuccessful. Frequent guest Richard Lawson steps in at Redcar and against Rye House while the popular former Panther, Kenneth Hansen, gets the nod at Somerset. Panthers are struggling to find a guest to replace Lewis Blackbird at Somerset when he has Elite League action with Wolverhampton. Their intended stand-in, David Bellego of Sheffield, has since been laid off with a hip injury. Meanwhile the impressive Michael Palm Toft is prepared to extend his stay with the club if necessary. 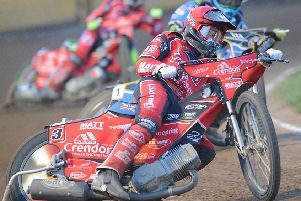 The Danish ace was drafted in as a short-term replacement for Adam Roynon after he suffered broken ribs and a punctured lung in a crash on the opening day of the season. Roynon is set to begin his comeback in the coming days with post-meeting practice laps after all three Panthers meetings. Panthers bosses could potentially reshuffle their pack to include both Palm Toft and Roynon in the coming weeks. The Peterborough Panthers Speedway Supporters’ Club (PPSSC) have organised two collections for sidelined star Allen. The first will take place at the group’s next social event - a St George-themed quiz night at the Post Office Club in Bourges Boulevard tomorrow night (Friday, 7.30pm). And a second collection will be held during Sunday’s home fixture.